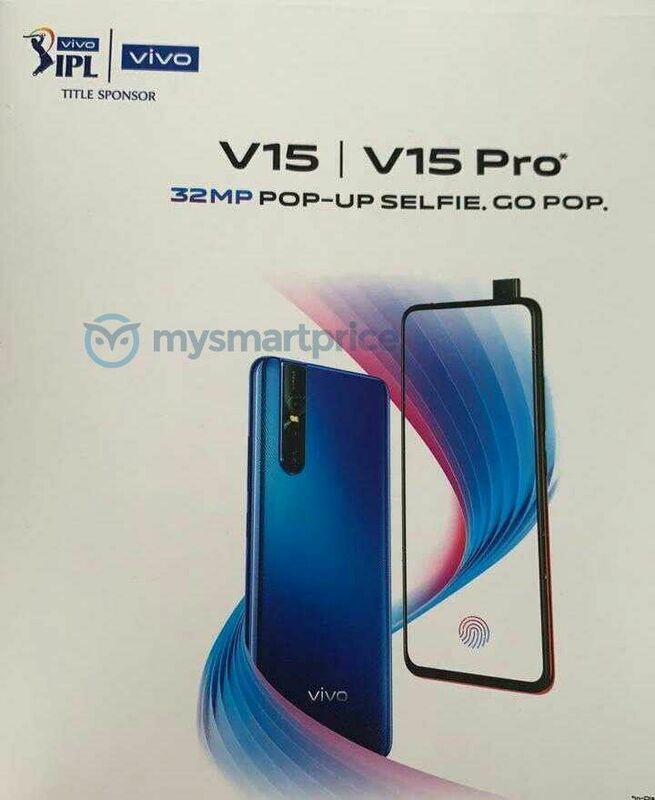 The Vivo V15 Pro is a mid-range smartphone with a completely bezel-less screen, a pop-up selfie camera, and a triple-camera setup at the rear with a 48MP sensor. 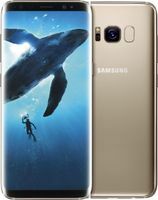 It has a 6.39-inch Super AMOLED screen with Full HD+ resolution, DCI-P3 color gamut, an in-display fingerprint reader and no bezels at all. The phone runs Android 9 Pie, and uses the Qualcomm Snapdragon 675 processor, 6GB RAM, and 128GB internal storage. Its 32MP selfie camera pops up from the top, and at the rear, there’s a triple-camera with 48MP wide-angle camera, 8MP ultra-wide camera, and a 5MP depth-sensing camera. The dual-SIM 4G LTE phone comes packed with a 3700mAh battery, features Dual Engine fast charging, and has a microUSB 2.0 port. Pros: The Vivo V15 Pro is the most stylish phone in this price segment. It has a futuristic pop-up camera along with an excellent OLED panel without any notch. Its cameras are excellent and its battery life is also quite good. Cons: Vivo's FunTouch OS is in urgent need of refinement. Furthermore, the phone makes use of a plastic frame. For its price, it is baffling why the phone still comes with a Micro-USB port. The loudspeaker on the phone is also quite weak. Summary: With the Vivo V25 pro, you get bragging rights to a futuristic pop-up camera on a quite an affordable price. This design also helps you get an unobstructed viewing experience. 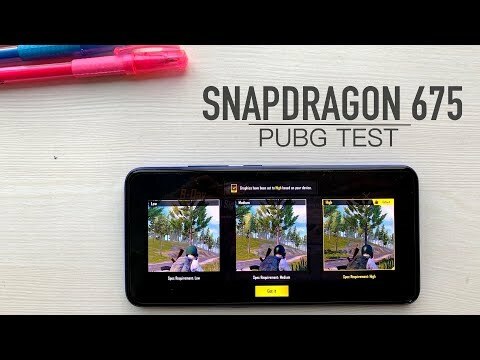 You also get good performance courtesy of a Snapdragon 675 SoC. As long as you can put up with Vivo’s Funtouch OS, this phone is worth considering, With that said, the Asus Zenfone 5 can be a better option if raw performance is what you are looking for. The Vivo V15 Pro price in India is Rs 28,990 for the 6GB + 128GB internal storage variant. The phone is available in 4 variants: Topaz Blue, Red, Ruby Red, Blue. The phone was launched in India on 30 November -0001. 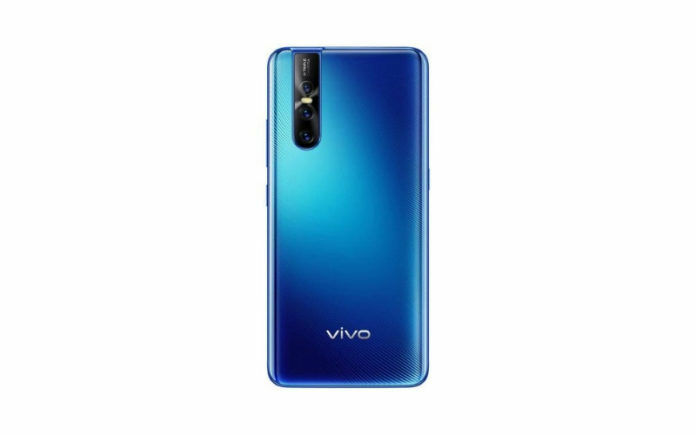 The Vivo V15 Pro has a 6.41-inch Ultra FullView Display which uses Samsung’s Super AMOLED panel with Full HD+ resolution (2316×1080 pixels), advanced E2 luminescent materials, 100% DCI-P3 color gamut coverage, and over 85% screen-to-body ratio. It also features Always On Display to show information like time, date, battery percentage, and notification icons. Since the front-facing camera pops up from the top of the phone, there’s no need of a screen notch, making the device a truly bezel-less screen device. The mechanical pop-up mechanism is said to be durable enough for over 3,00,000 cycles and 120kg pressure. The phone is covered by glass material at the front and the rear, and its chassis is made using aluminum. The Vivo V15 Plus uses the ultra-powerful Snapdragon 675 processing chipset from Qualcomm. It is second to only the Snapdragon 845 among all the chipsets released by the US-based chipmaker in 2018. The chipset is paired to 6GB of RAM and 128GB of internal storage space. The smartphone runs Android 9 Pie operating system underneath the FunTouch OS 9 software user interface. The Vivo V15 Pro is among the first few phones released in the world to feature a 48MP camera sensor from Samsung. The phone features a triple-camera setup which includes the Samsung GM1 48MP ½-inch camera sensor with a wide-angle lens, an 8MP ultra-wide-angle lens, and a 5MP depth sensor with f/2.4 aperture. The 48MP sensor has an f/1.8 aperture, 0.8 micro pixels, and phase-detection autofocus. The phone can record 4K videos at 30fps. The selfie camera on the V15 Pro uses a Samsung-made ISOCELL GM1 32MP sensor. The front-facing camera can record 1080p Full HD videos at 30fps. The Vivo V15 Pro comes with a beefy, 3700mAh non-removable battery. 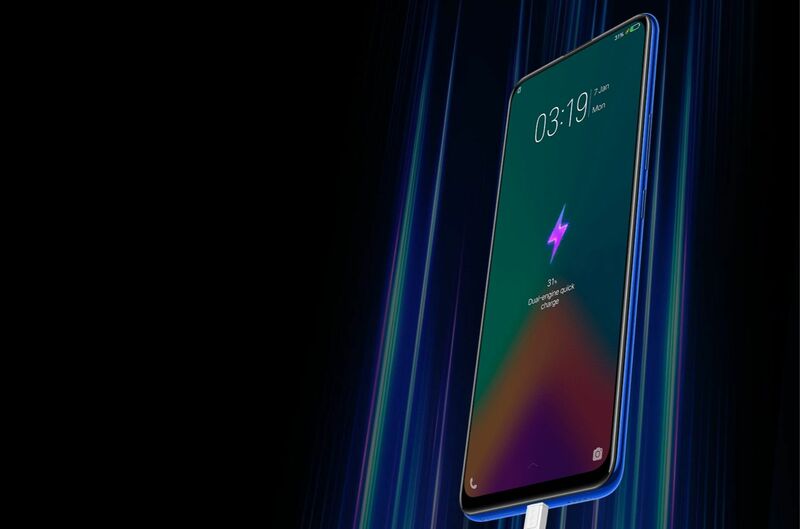 To charge the battery faster, the phone uses the company’s Dual Engine Fast Charging technology to top up the battery capacity by up to 24% in just 15 minutes. The phone features dual-SIM card slot with 4G LTE connectivity as well as 3G and 2G compatibility. The Vivo V15 Pro also features dual-band Wi-Fi ac/b/g/n, Bluetooth 5.0, NFC, and a microUSB port. Vivo V15 Pro vs. Vivo V11 Pro: What Has Improved? The Vivo V15 Pro succeeds last year’s Vivo V11 Pro, and it comes with various improvements, including a completely bezel-less screen, faster in-display fingerprint reader, better cameras on the front and rear, a faster processor, newer software, and a larger battery. 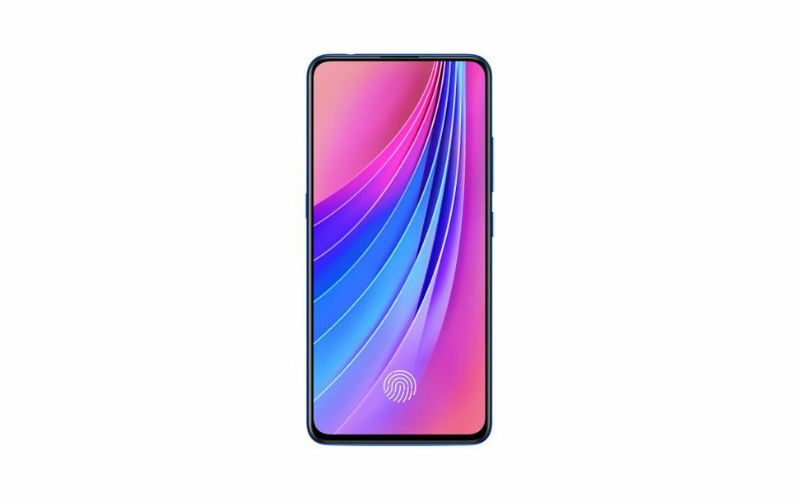 The Vivo V15 Pro has a slightly larger Super AMOLED screen with a few more pixels, but it comes with a fifth-generation in-display optical fingerprint reader, which is faster and more reliable than the 4th-generation optical fingerprint reader that was used in the V11 Pro. The Vivo V15 Pro also runs FunTouch OS 9, which looks cleaner and more intuitive compared to FunTouch OS 4.5. 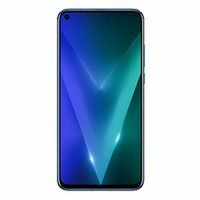 The phone also uses the Qualcomm Snapdragon 675 processor, which has faster CPU cores and a more powerful GPU compared to the Snapdragon 660 processor which is used in the Vivo V11 Pro. The phone also features a 3700mAh battery, which has more capacity compared to the 3400mAh battery inside the V11 Pro. It also features Dual-Engine charging. The Vivo V15 Pro uses a much better, 48MP sensor at the rear along with an ultra-wide camera, something that was missing from the V11 Pro and comes genuinely handy in certain scenarios. The 32MP Samsung GM1 camera sensor at the front also captures more detailed selfies compared to the 25MP sensor that was used in the Vivo V11 Pro. Yesterday, we brought to you the first clear hands-on video of the upcoming Vivo V15 Pro mid-range smartphone. While the hands-on video only confirmed the presence of an “AI Triple Camera” on the back of the handset, we have now obtained the complete spec sheet of the V15 Pro. The Vivo V15 Pro will feature a 6.3-inch Super AMOLED Ultra FullView display with Full HD+ resolution and an In-display fingerprint scanner. Just as expected, the smartphone will run on an octa-core Qualcomm Snapdragon 675 11nm processor, coupled with 6GB of RAM. In terms of storage, the V15 Pro will only be offered in a single variant with 128GB of internal memory. Moving on to optics, the upcoming Vivo handset will sport a 48MP + 8MP + 5MP triple-camera setup at the rear and a 32MP pop-up selfie camera. Keeping the lights on will be a 3700mAh capacity battery with Dual Engine fast charging. 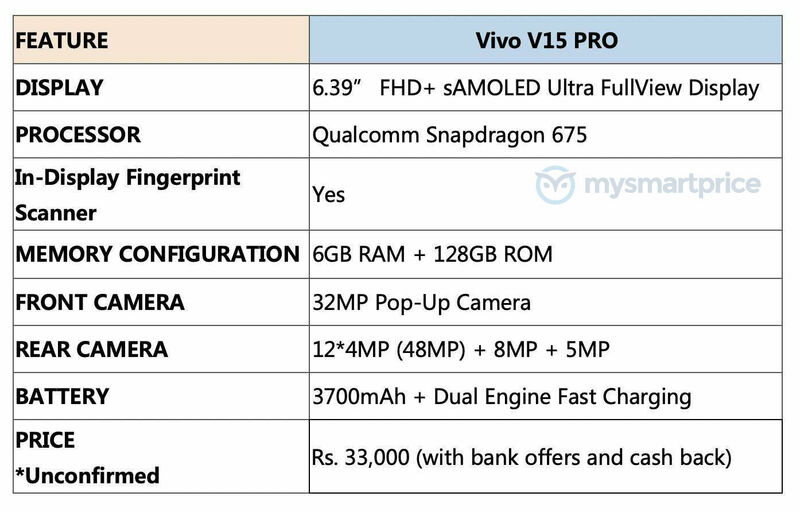 As for pricing, our source suggests the Vivo V15 Pro will cost INR 33,000 in the country. However, this is likely to be inaccurate as we expect the smartphone to be priced well under INR 30,000. Just days before the Mobile World Congress 2019 kicks off in Barcelona, Chinese smartphone maker Vivo will introduce its next-generation V-series smartphone at an event in India. The company released a new teaser video earlier today, which confirmed the smartphone’s pop-up camera design. Thanks to a trusted source, we have obtained a hands-on video as well as a live image, both of which give us a clear look at the upcoming V15 Pro from the back. 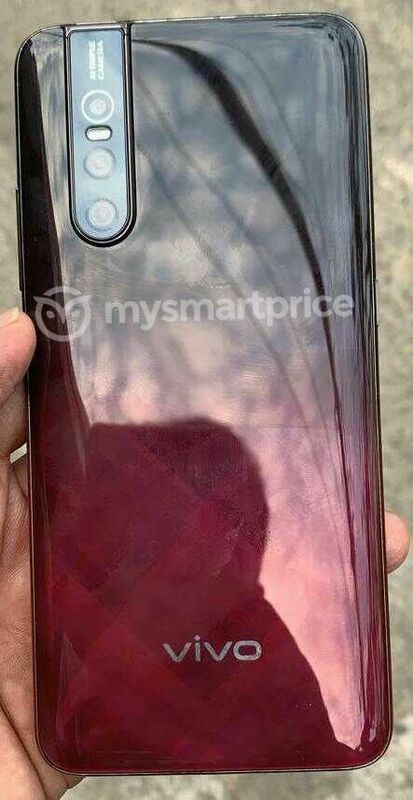 The hands-on video shows the upcoming V15 Pro smartphone in a Black and Red gradient finish with a diamond pattern. As you can see in the video below, one of the key features of the V15 Pro will be the “AI triple camera” with a 48MP primary sensor. The dual-LED flash module is placed right below the primary sensor. 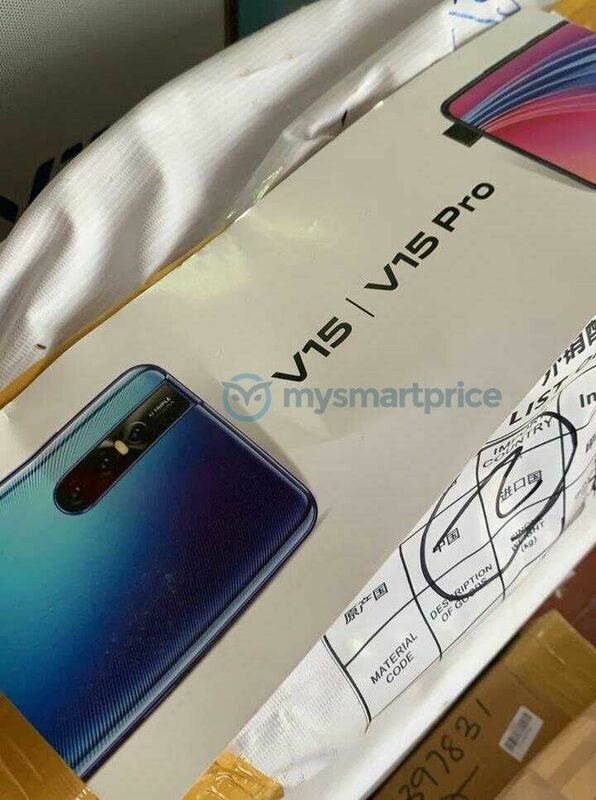 In addition to the live image and the hands-on video, we have also obtained a few images showing promotional posters for the upcoming V15 and V15 Pro smartphones. These confirm the two smartphones will share a similar design with a 32MP resolution pop-up selfie camera. However, we expect the V15 and V15 Pro to be different from one another in a few other areas. Under the hood, Vivo’s V15 Pro is going to be powered by an 11nm Qualcomm Snapdragon 675 octa-core processor under the hood. Compared to the Snapdragon 660 AIE chipset powering the current V11 Pro, the Snapdragon 675 delivers a significant improvement both in terms of performance and efficiency. In the memory department, the mid-range smartphone is rumored to be available with 6GB of RAM and 128GB of internal storage. Just like its predecessor, we expect to see a dedicated microSD card slot to allow further storage expansion up to 256GB. While the smartphone’s display size has not been confirmed yet, it is rumored to utilize an AMOLED panel with extremely thin bezels on all sides and Full HD+ resolution. In India, the Vivo V15 Pro is tipped to be priced somewhere between INR 25,000 and INR 30,000. Pre-bookings for the Vivo V15 Pro will open in the country on February 15.